Apple’s headquarters in Cupertino is one of the places on Earth you’d probably never get to see from the inside. Apple obsesses about security like no other company that we know of, and so far this strategy has worked. But over the years photographs from inside the Apple stronghold have appeared, and here is a bunch of them painting the reality of the world’s most valuable company. You can see the beautiful spacious floor plans, and Apple ads all over the place. And when employees are not working there’s plenty of options to chill - a ping-pong table for a quick game, and even an outdoor-basketball court. The massive work of gathering all the images from all the various source is courtesy of Apple Gazette. For the rare few who do get to visit Cupertino, there are parts that are publicly accessible like the store selling Apple gear. It’s the only place where you can get your fanboyism backed up with a t-shirt with Apple’s logo. Finally, as you can see, some of the images are not exactly new, but we’re glad they’re out. Check them all out in a slideshow below to immerse yourself in the reality of Cupertino. OMG, that's pretty funny: they mostly wear black turtle-necks purchased at the on-iSight App'Arrel Store. Number 15 sorta looks like a boardroom crossed with a church...which makes things very weird. And number 25 is a rare shot of Steve without a turtleneck! Great looking place but I think Microsoft's HQ looks like a cooler place to work(at least has a much better cafeteria/food court). Source: Apple Gazette - And that explain everything. Very reminiscent of Scientology's headquarters... Even drone-looking people are present. Yea get back to work right now parasites! 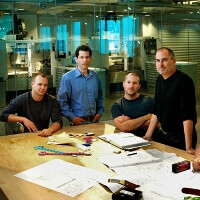 Man some of these pictures must be really old because the one with Steve Jobs in it shows him before he lost a lot of weight.